RG Residency in Sector-120 Noida, Noida by RG Group Builders is a residential project. 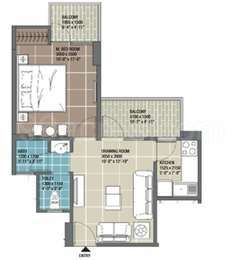 The size of the Apartment ranges in between 584.0 sq.ft. 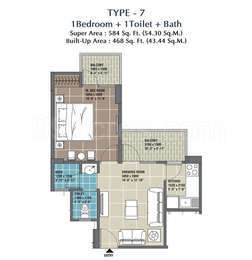 and 1815.0 sq.ft. RG Residency price ranges from 24.52 Lacs to 79.65 Lacs. RG Residency offers facilities such as Gymnasium and Lift. This is a RERA registered project with registration number UPRERAPRJ6255. Bank loan approved from HDFC home loans, ICICI, State Bank of India, Indian Overseas Bank, Allahabad Bank, Bank Of Baroda, Indian Bank, IDBI Bank Ltd., Indiabulls and PNB Housing Finance Limited. The project is spread over a total area of 12.75 acres of land. RG Residency has a total of 12 towers. The construction is of 22 floors. An accommodation of 1540 units has been provided. RG Residency brochure is also available for easy reference. 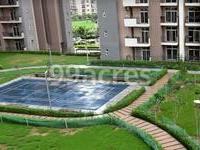 In which area is RG Residency located?The project is situated in Sector-120, Noida. What are sizes of apartments in RG Residency? The apartment sizes in the project range from 584.0 sqft to 1815.0 sqft. What is size of 1 bhk in RG Residency? The area of 1 BHK apartments ranges from 584.0 sqft to 590.0 sqft. What is the area of 2 bhk in RG Residency? The size of a 2BHK unit in the project ranges from 1092.0 sqft to 1317.0 sqft. What is size of 3 bhk in RG Residency? The area of 3 BHK apartments ranges from 1493.0 sqft to 1815.0 sqft. What is total size of RG Residency?The project is built over an area of 12.75 Acres. RG Group Builders is a leading real estate company in Delhi/NCR region, offering its stakeholders and customers with finest realty solutions. The group focusses on the construction of simplified residential and commercial space. The company has delivered around 14 commercial and retail projects all over Delhi and has got 10 million sq.ft. of built up area under construction. The group has completed some of the residential projects including RG Residency in Sector-120, Noida; Rajesh Raj Sundaram in Dahisar East, Mumbai Andheri Dahisar. The group?s ongoing projects are RG Luxury Homes in Sector-16 B Greater Noida; RG Kvir Towers in Greater Noida West; RG Pride in Greater Noida West; among others. What is the price for a 2BHK apartment in RG Residency? Is the project good choice for end-use? There has been a recent incident in which a resident has filed a complaint against the malfunctioning of the lift. The issue was reported in advance but the management has failed to address the issue on time. I would recommend you to speak to the residents before taking the final decision. 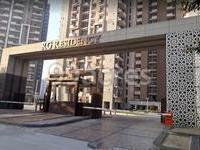 Hi Joey, RG Residency is located in sec 120 which is one of the developing region in Noida.It offers sound connectivity to neighbouring areas like sec 122, 119, 73, 121 as well as key places of Noida and Delhi via Vikas marg, and Golf Course. Even, civic utilities like The Manthan School, Tripathi hospital, Needs Everyone mart, Kaima shops, Shree Om general store, ATMs of several banks like HDFC, ICICI, etc. However, getting a public transport is an uphill task here but you can get private cabs at the main entrance of the society. Otherwise it is a good option to consider. Hi Joeymathews, a 2BHK in this project will cost you between Rs 62 lakh and Rs 75 lakh. About the project I would say, it is located close to Vikas Marg, Sector-120 in Noida. You can find a few eating joints, grocery and medical stores and shopping centres as well. Since this area is gradually emerging as a developing sector near to Noida Expressway that has presence of several reputable companies and universities. Since the area is developing fast it can be considered as a good option for end-use. How much returns I can expect in future if I invest in RG Residency? Are there any other options available in the same area? 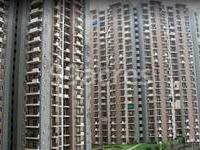 Hi Param, as per the prevailing price trends, the property prices in sector 120 Noida are Rs 4,700 per sq ft and have marked a marginal dip of around 2 percent in the last two quarters. If realty experts are believed, there a market revival is expected in another 4-5 years. Moreover, there is a proposed metro station in a neighboring sector which will add on to the connectivity quotient of the project. In case, you want to explore other options, you can have a glance at some of the popular options like Prateek Laurel, Amrapali Zodiac among others.